Why Should You Consider the Deferred Sales Trust? If you are considering the sale of a business, corporation, or investment real estate, you may face capital gains tax associated with that sale. For the investor who does not want to continue holding investment property or remain in the same business, a Deferred Sales Trust should be considered. 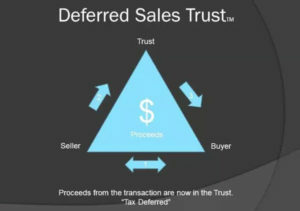 According to Section 453 of the Internal Revenue Code, the Deferred Sales Trust provides investors a solution whereby they can defer capital gains upon the sale of their assets and redirect the sale proceeds into cash or whatever types of investments suit their needs, income requirements and objectives. The Deferred Sales Trust is a legal contract between you and a third-party trust in which you sell real property, personal property or a business to the Deferred Sales Trust created for you. This is in exchange for the Deferred Sales Trust’s contractual promise to pay you a certain amount over a predetermined future period of time in the form of an installment sale note or promissory note. It is often referred to as a “self-directed note” because you have control over the terms of the note. The Deferred Sales Trust gives you the ability to control your capital gains tax exposure, reinvestment terms of the sales proceeds, and installment payments made from the trust. How Does a Deferred Sales Trust Work? The process begins when a property or business owner transfers their asset to a trust managed by a third-party company, as Trustee on their behalf. The third-party company acts as trustee over the asset, and the owner is the secured creditor of the trust that holds the asset. The trust will sell the asset to the owner’s buyer and manage and distribute the sale proceeds of the trust according to an agreed-upon installment contract that the owner sets up ahead of time with the Trustee. The sales proceeds can be held in cash, reinvested and distributed according to the direction of the owner’s installment contract. There are zero taxes to the trust on the sale, since the trust purchases the property from the owner for the same price for which it is sold. The tax code does not require payment of any of the capital gains taxes until an investor starts receiving installment payments that include principal. The owner is then able to control if, when, and how there will be capital gains tax exposure over the installment contract period by adjusting the installment contract. The installment contract between the owner and the trust company provides flexible options on when and how payments can be made. Initially, the owner may have other income and may not need the installment payments right away, which would defer income and capital gains taxes. If an owner wants income but does not want to pay capital gains taxes, he/she can set up the installment contract to pay interest-only payments from the reinvested sales proceeds. According to IRC Section 453, this strategy can defer the capital gains tax indefinitely. 6) Reviewed by FINRA and SEC with no adverse opinion – Allows broker-dealers to approve their advisors to participate in the DST Strategy for clients. 8) Campbell Law indemnifies each client for their work. If an adverse finding occurs resulting in interest or penalties on a client transaction, Campbell law pays them. 9) A legal and tax cite package is available to a bona fide client or such client’s legal or tax advisor with a signed NDA. Also, when clients are trying to research on their own, the basis for the DST is IRC 453 dealing with Installment contracts. If you would like to schedule a call or video conference with Greg Reese, one of the leading DST Trustees in the country, you can use the following link to his calendar https://calendly.com/reefpoint, or call Greg at (866) 867-8633.